Perfect for lean management displays and boards, Fridge-Lyt magnetic frames are the new light weight magnetic frames that protect your photos and documents while they display them, on any surface in the home, school or office. Fridge-Lyt frames present a beautiful colored border to offset your photo or insert document. 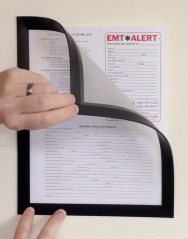 Choose from three different covers for your needs; non-glare clear vinyl, glossy clear vinyl or no vinyl for easy markings on the displayed piece. Fridge-Lyt frames are available in black or white in 4x6, 5x7, 8½x11 and 11x17 sizes. 4 x 6 size, $6.20 ea. Now $4.85 ea. As low as $3.85 in bulk. 5 x 7 size, $6.50 ea. Now $5.40 ea. As low as $4.25 in bulk. 8.5 x 11 size, $11.40 ea. Now $10.35 ea. As low as $7.25 in bulk. 11 x 17 size, $20.25 ea. Now $14.95 ea. As low as $11.30 in bulk. The back of each Fridge-Lyt frame is solid 60 mil thick magnet, corner to corner, that won't curl up and fall off. This solid magnet back holds the frame and insert to any steel surface with a lip to secure the insert in perfect position in the frame. Fridge-Lyt frames are American made of precisely cut materials. If the door of your fridge is full, you can mount a Fridge-Lyt magnetic frame just about anywhere with a Magnamount to hold your magnetic Fridge-Lyt frame on any wall. Just peel off the protective paper backing to reveal the self adhesive backing and stick the Magnamount to a surface where you want to display a Fridge-Lyt frame. Fridge-Lyt magnetic frames stick to the surface of a Magnamount or to any wall painted with our new Magically Magnetic Paint. For custom color or other sizes, just contact us for more information.